On Saturday, Angela Merkel and Emmanuel Macron symbolically signed a memorial book in a railway carriage resembling the Compiègne Wagon, in which the German and French delegations sealed the much-anticipated armistice in November 1918, putting an end to the WWI fighting. 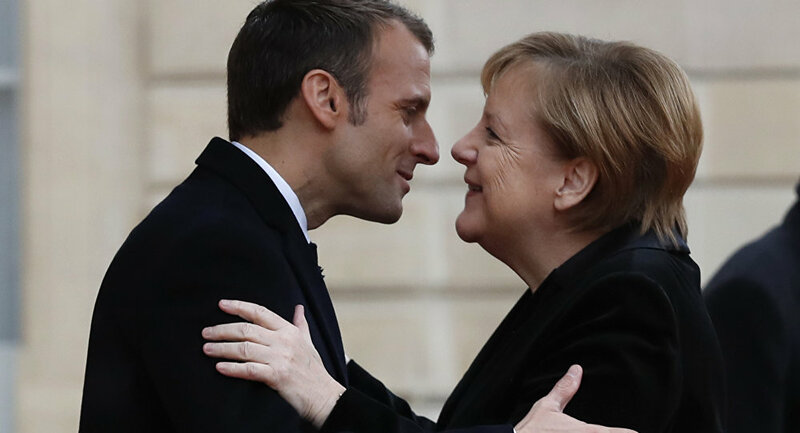 An awkward, albeit touching moment occurred at the Frist World War centennial anniversary celebrations over the past weekend, when a 101-year-old woman took Angela Merkel for France’s First Lady, who is approximately the same age as the German Chancellor. The heads of state partook in an emotional ceremony near the town of Compiègne in northern France, where the armistice was signed to end the fighting in World War One, with both leaders signing a book of remembrance in a railway carriage identical to the one in which the historic document was sealed. At some moment they even held hands to express their shared commitment to global reconciliation. Although Merkel presented herself without delay as “the Chancellor of Germany,” initially in German, the senior lady seemed not to notice her claims being outright debunked. She then assured the president she would by all means be present at next year’s memorial event, as well. Over the weekend, France, as well as other European cities, hosted a series of events marking a landmark ceasefire in the World War One bloodshed, which was sealed in November 1918, with the end of the war formalized the following year by the Treaty of Versailles. On Sunday, the French capital saw world leaders from over 70 countries arrive at Paris’ Arc de Triomphe for an official ceremony marking this year’s 100th armistice anniversary.